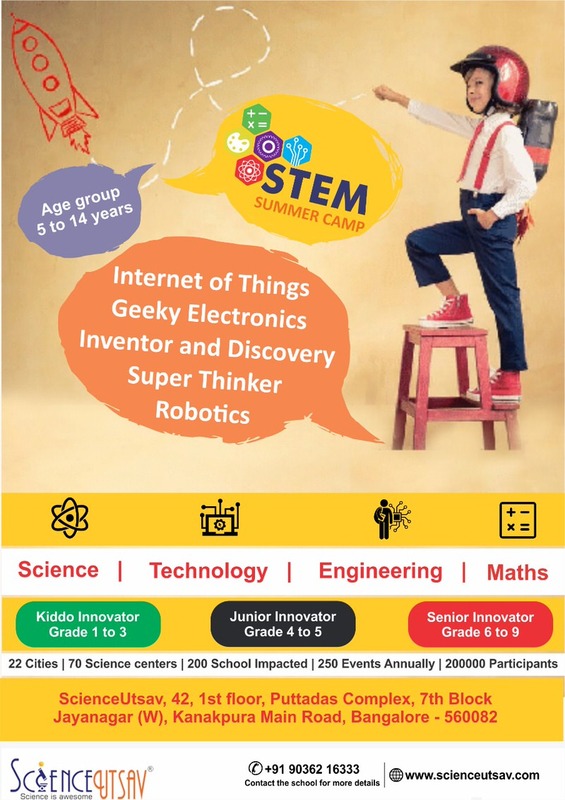 Check out these phenomenal robotics and science summer camps in Bangalore! 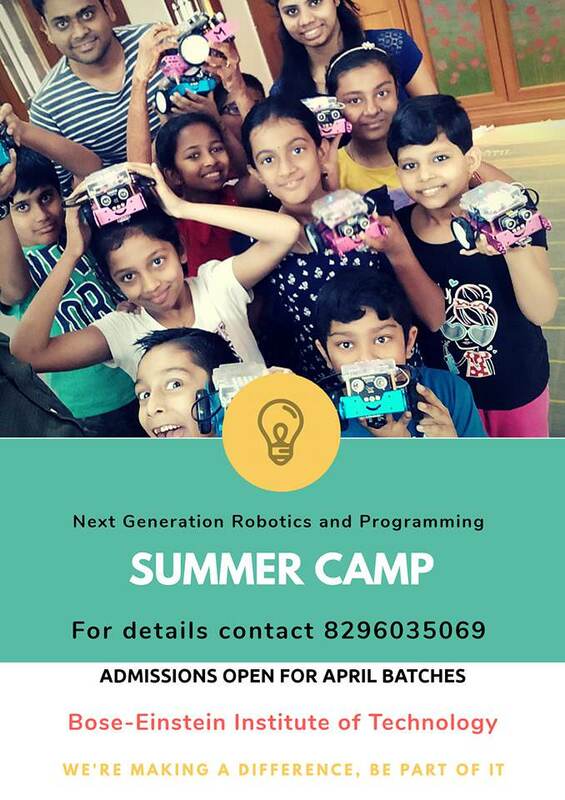 Bangalore has some of the best robotics and summer camps in the country. Don’t believe us? Take a look at our list! Robotics and science summer camps are dime a dozen these days but what makes a good workshop on these fun and fundamental STEM subjects? A multidisciplinary approach always works and a hands-on camp can unwrap some amazing potential in children who have a good foundation in STEM. For children who love astronomy, robots and even superheroes, there are wonderful camps to introduce them to science in a fun way. 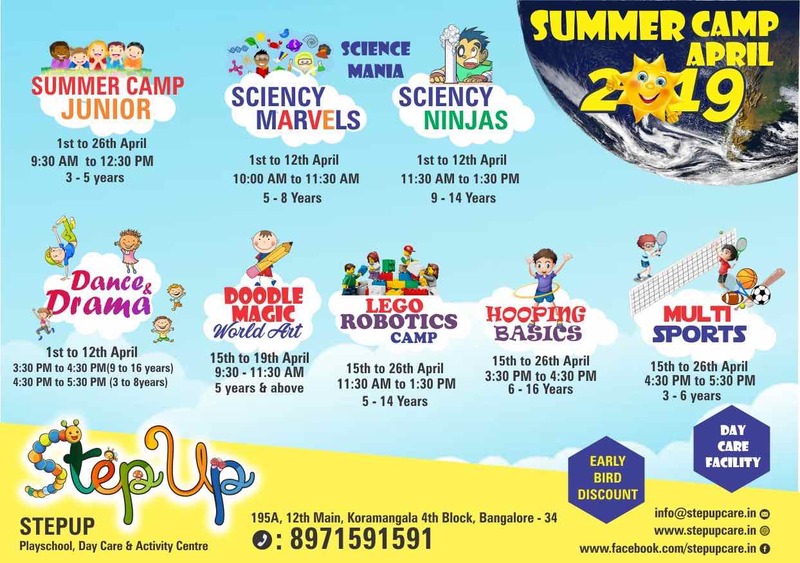 Check out our list of the best Robotics and Science summer camps in Bangalore! Here are top 15 robotics and science summer camps that we have curated for you from over 42 camps in this category. Evolvingminds summer program as a platform, constantly engages the young minds to initiate and ignite cognitive learning in them. Their unique mentoring process is the most effective tool in helping them gain confidence in themselves and their abilities to think, interact, learn and grow. 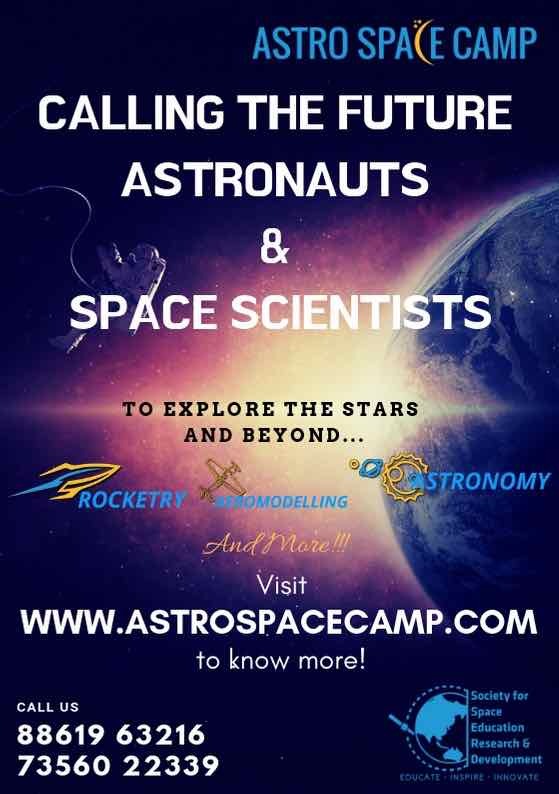 The SSERD Summer Astro Space Camp is an exciting summer camp to help children experience the vastness and beauty of space through various hands-on activities. Bose-Einstein is a place where student explore STEAM (Science, Technology, Engineering, Arts and Math) through fun and by building hands-on activities. The program focuses on helping kids experiment, make exciting discoveries and enhance curiosity through STEAM based education. 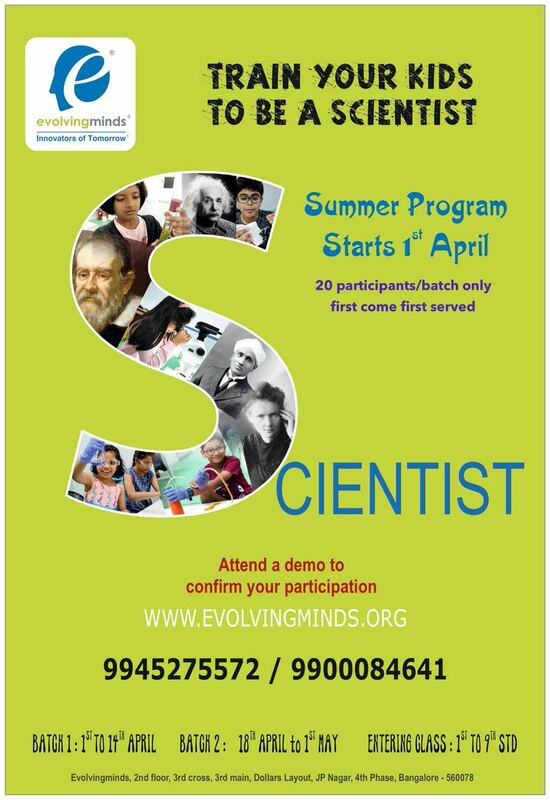 ScienceUtsav's STEM Summer Camp is a 10 day camp for kids aged 5 - 14 years. They are providing various options in choice of batch and timing. So, register with them to get your suitable batch and also avail the early bird offer! In these hands-on STEM Camps students are guided through a series of interactive stem projects and experiments that challenge their creativity and imagination. Students will work individually and in teams to conduct their projects. With the knowledge of “how to”, students learn to be creative, critical, and organized thinkers, and problem solvers. Blue Ribbon Robotics & Theatre Summer Camps in Indiranagar will introduce kids to basic to robotics and introduce them to coding as well. First Drop will be conducting the theatre workshop to help children in personality development as well as confidence building. STEMDroid Maker Shed is conducting an Arduino Based Summer Camp for kids. Arduino Starter Kit Projects will be a 10 days camp where children will learn basic electronics and basics of Arduino hardware and software. They will also make 10 projects using Arduino. This summers keep your children engaged with curiosity, experiments and fun at Decode X and Why Curious Scientists Camp. Join in for an exhilarating sciency hands-on experience. 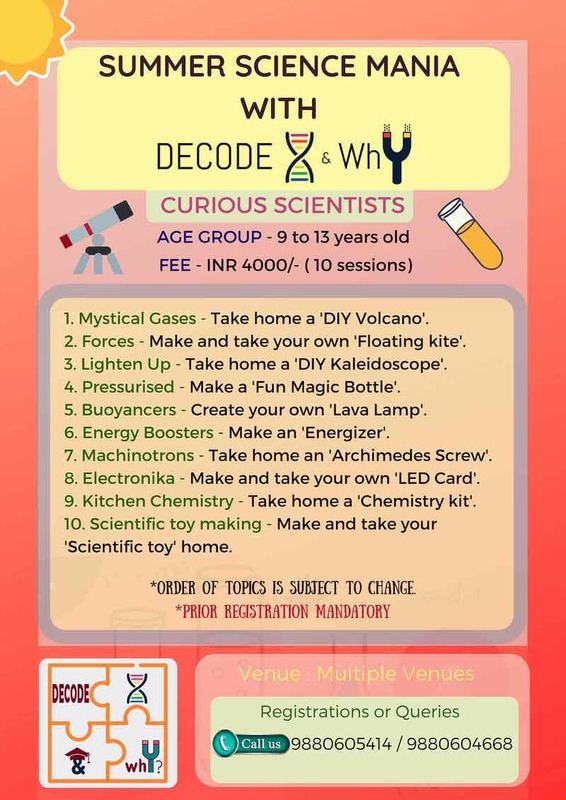 Get to experience from an array of experiments and activities curated for young minds to build curiosity in day to day life! STEM Explorer Camp are an ideal hands-on solution for early finishers, morning work, centers, fine motor practice, indoor recess, or positive reinforcement of behaviour. They are also a creative and developmentally appropriate form of engineering for pre-school kids. Ever wanted to make STEM subjects entertaining for your kids and get them engaged and energised? This camp may be just what you need! There's also dance for the juniors and space exploration to boot. This is for the geeks and nerds out there. Have fun! 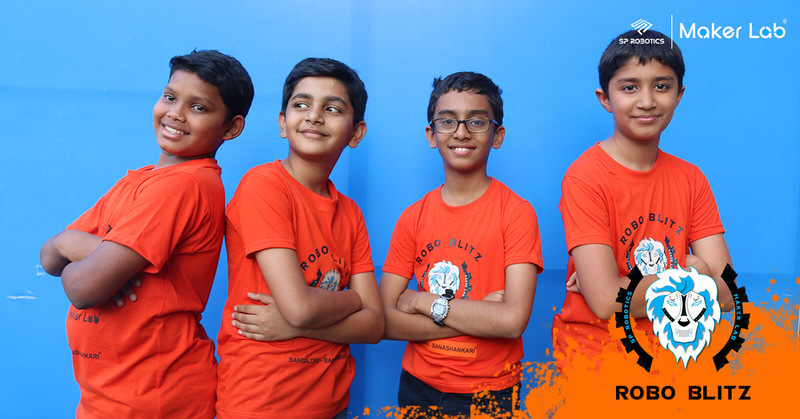 Rocket Pathshala LEGO Robotics Summer Camp 2019 is a wonderful opportunity for students to explore the world of Robotics. 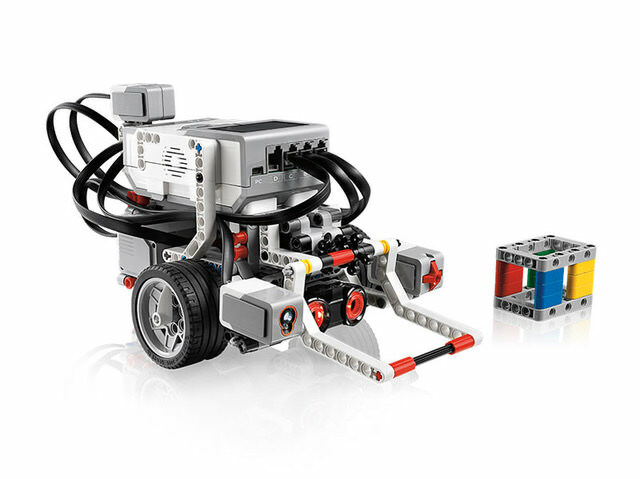 Participants will use LEGO® MINDSTORMS® EV3 and WeDo2.0 modular and programmable kits. 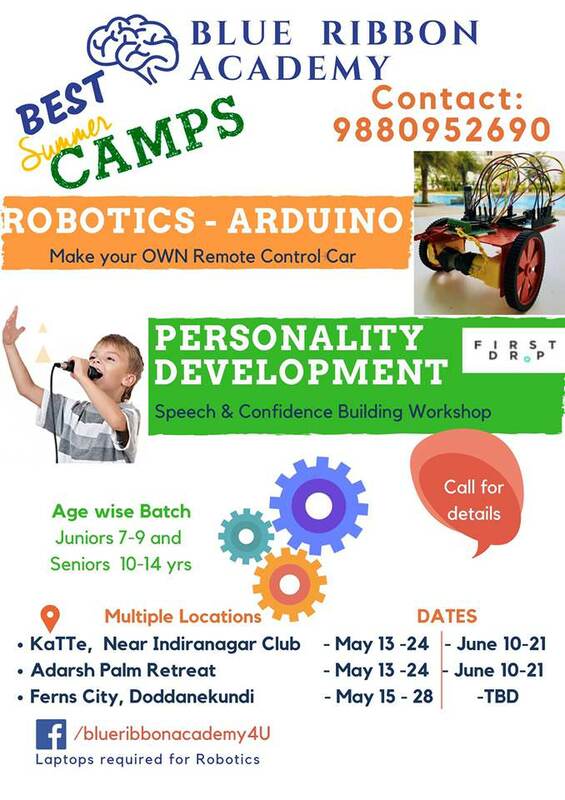 SP Robotic Works is organizing India's Largest Robotics Summer Camp. They are the leader in providing innovative, hands-on education on the latest technologies such as Robotics, IoT (Internet of Things), Virtual Reality through a structured learning experience. Fun and learning come together in this wonderful workshop in Malleswaram. The focus will be on robotics, aero modelling and Abacus. 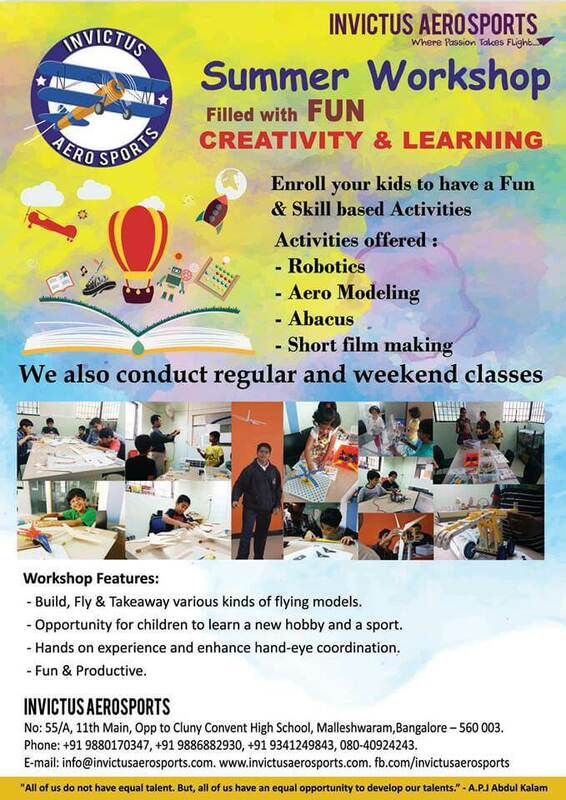 Learn to build flying models and enhance eye-hand coordination skills. 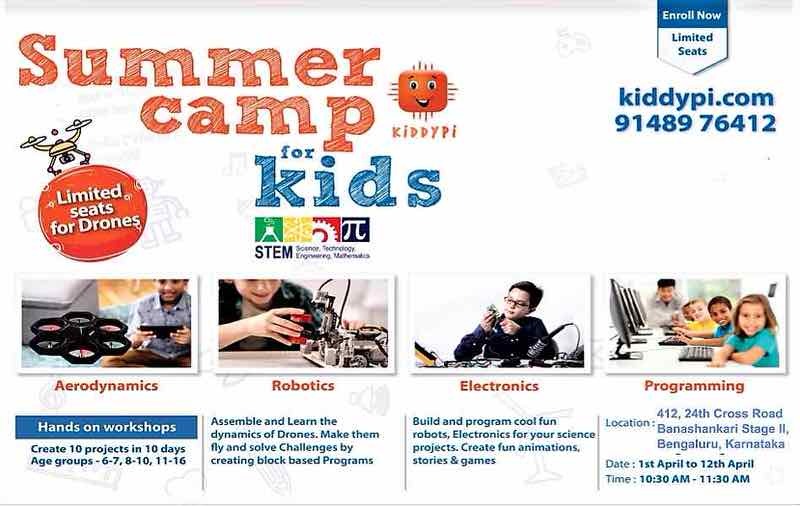 KiddyPi Robotics Summer Camp is a hands-on workshop for Kids. Kids will design, build and program Robots while improving teamwork skills. 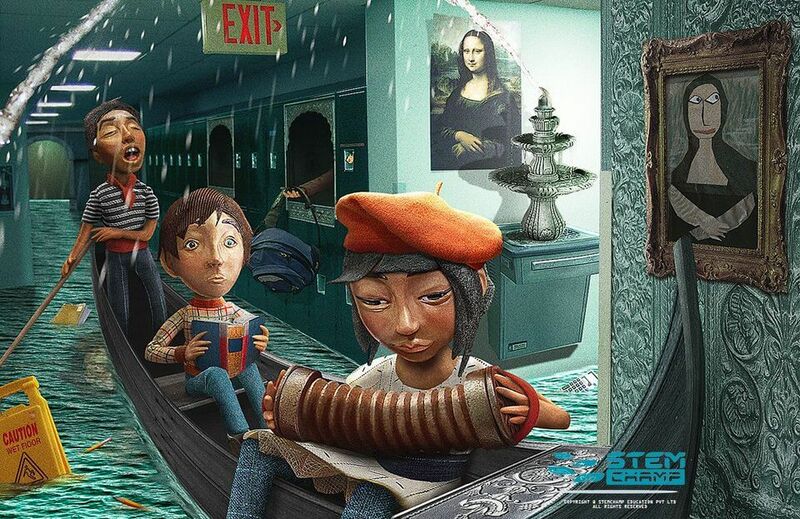 Workshops are designed to stimulate child's creativity and Imagination. Their Robotic workshops are exciting and fun filled providing cool essential growth experiences to carry for future. 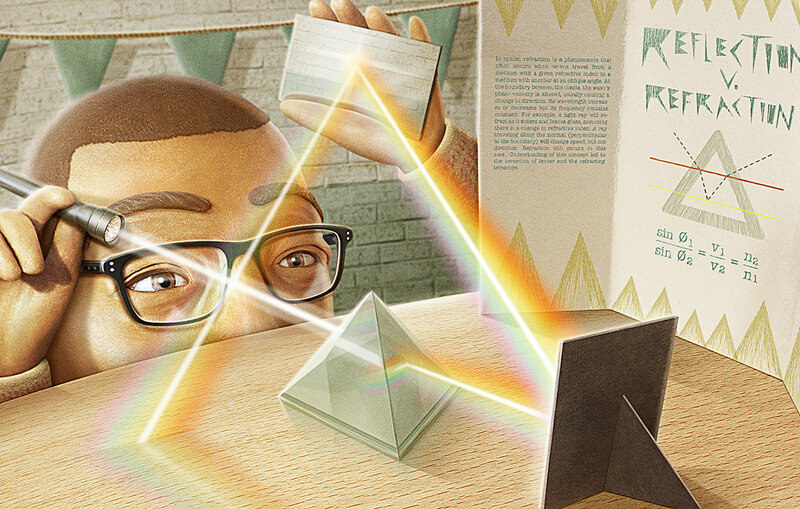 Each of their micro-projects and goal-based-scenarios is a fun combo of all three. 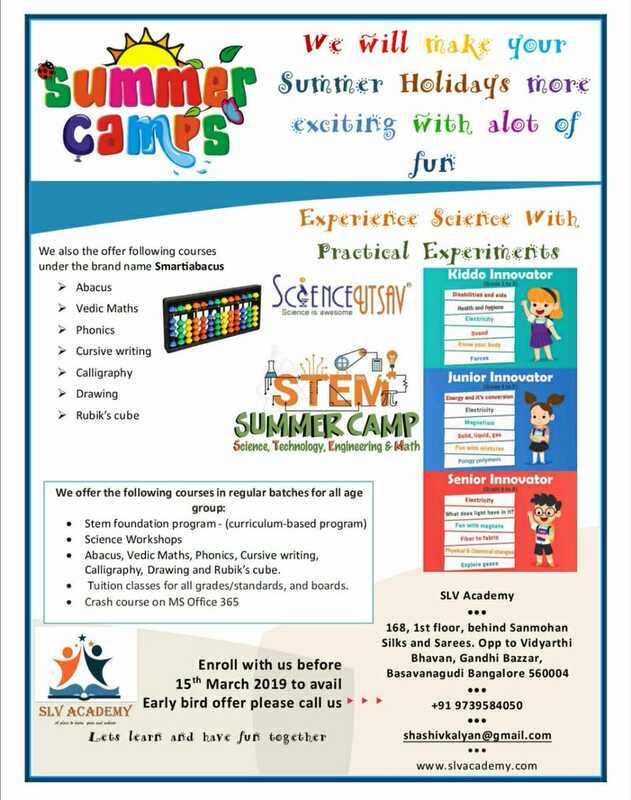 SLV Academy is organising a Full Level Course this summer where children will be introduced to basic of Abacus, Vedic maths, Phonics, Handwriting, Cursive writing, Calligraphy, Drawing & Rubik's Cube.